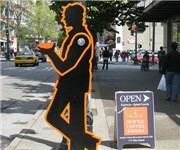 Located in downtown Seattle between First and Second Ave, half a block East from Pike Place Market. WiFi with purchase. This Pike Place coffee shop spotlights the beans from local roasters, including Caffe Umbria, Lighthouse, Brown's and more. How Would You Rate Seattle Coffee Works?